The wait is over! The five-member selection committee of the Board of Control for Cricket in India (BCCI) on Monday announced the 15-player squad for the much awaited International Cricket Council (ICC) Cricket World Cup 2019. But what shocked the most was the inclusion of Vijay Shankar. In India's crucial No. 4 batsman, the selection committee has chosen Vijay Shankar. India Team for ICC Cricket World Cup 2019 Announced, Check Full 15-Man Squad. 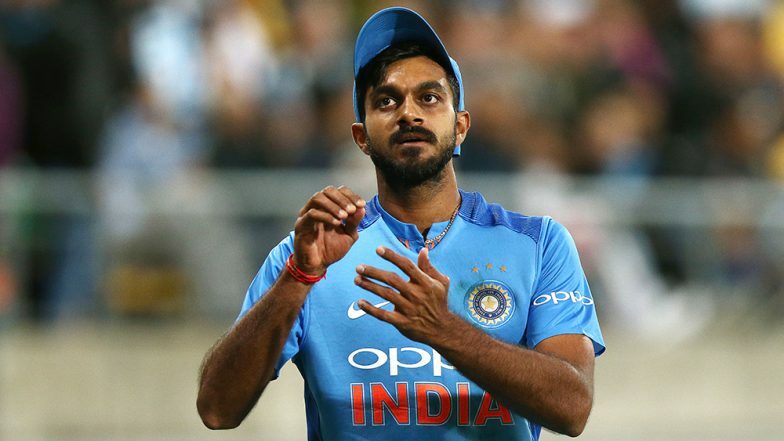 The appointment of Vijay Shankar has raised alarms as the Sunrisers Hyderabad batsman hasn't really been in good form in the last seven matches in the Indian Premier League (IPL) 2019. In the last seven matches, Shankar scored 40-35-9-16-5-26-1. The Tamil Nadu all-rounder also struggled with the bat during the 2018 Nidahas Trophy where he managed just 17 off 19 balls in the T20 match against Bangladesh. Ambati Rayudu Left Out of Team India for ICC Cricket World Cup 2019, Check Full 15-Man Squad. However, at the same time, the all-rounder has impressed with his bowling, especially during his final over in Nagpur ODI against Australia. The Australian side just needed 11 to win of the final six balls, and the medium pacer struck two wickets in his first three deliveries. India won that match by eight runs. Twitterati Shocked With Vijay Shankar's Selection, Wanted Rishabh Pant in CWC19 Squad. "I Wish BCCI Could have Roped Suresh Raina / Rishab Pant Instead of Vijay Shankar. Still looks Good! Happy With Rahul's Selection," said one user. "So they have considered Vijay Shankar/ Kedar Jadhav for 4th spot and if both failed then they will go with Dinesh Kartik. Anyways every player for selected squad need to build up their confidence in remaining matches of IPL, though format is different. Btw Want DK in playing 11," another said. So they have considered Vijay Shankar/ Kedar Jadhav for 4th spot and if both failed then they will go with Dinesh Kartik. Anyways every player for selected squad need to build up their confidence in remaining matches of IPL, though format is different. Btw Want DK in playing 11. A Twitterati happy with Shankar's inclusion said, "Virat Kohli I am first time proud of you because you are choice to Vijay Shankar of World Cup team." "Regarding Vijay Shankar: He will be our Tom Moody. With his gentle medium pace, he will get carted around in England," another said. He will be our Tom Moody. With his gentle medium pace, he will get carted around in England. Virat Kohli (Capt), Rohit Sharma (vc), Shikhar Dhawan, KL Rahul, Vijay Shankar, MS Dhoni (wk), Kedar Jadhav, Dinesh Karthik, Yuzvendra Chahal, Kuldeep Yadav, Bhuvneshwar Kumar, Jasprit Bumrah, Hardik Pandya, Ravindra Jadeja, Mohammed Shami.